Veterans attend a memorial service for the 70th anniversary of the attack on Pearl Harbor on Dec. 7, 2011. Seventy-five years after Japan bombed Pearl Harbor and pushed the U.S. to enter World War II, some American veterans of the battle are in Hawaii to commemorate the anniversary Wednesday. Their numbers are dwindling fast, as are those of all World War II veterans. “I never will forget as long as I live,” Ray Chavez, age 104, told a local television station after arriving in Honolulu this week. He was referring to the battle that killed more than 2,000 American soldiers, destroyed more than 150 planes and damaged 19 ships. The events of what Franklin Roosevelt called “a date which will live in infamy” still consume the thoughts of its battle’s survivors, some of whom go to Pearl Harbor each year on Dec. 7. Chavez is one of just a few thousand living Pearl Harbor veterans. The Department of Veterans Affairs doesn’t have data on veterans of individual battles, and an alumni association for the battle disbanded in 2011, at the 70th anniversary, when it believed just 8,000 of the 84,000 uniformed Americans on Oahu during the attack remained alive. Since 2011, roughly half of veterans of World War II who were alive then have died, according to VA projections, leaving fewer than 700,000 alive today.1 Roughly 400 American WWII veterans die each day.2 The VA projects fewer than 3,000 veterans of WWII will survive to the 100th anniversary of Pearl Harbor, and that may be optimistic: That’s nine times the number of Americans age 110 or older — veterans or not — in 2010. 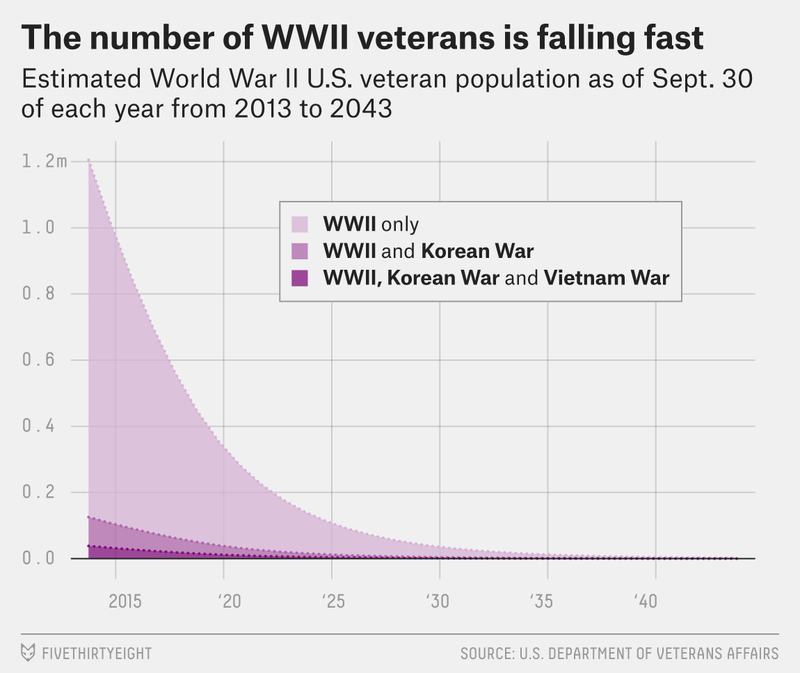 The overall number of veterans also is projected to decline, though more slowly because veterans who didn’t serve in WWII are younger as a group.3 This projection is less certain, because it depends on how many people serve in the military in the future. By 2043, the last year for which the VA projects the veteran population, the number of living veterans is expected to fall by 32 percent from this year. That would mean that veterans’ share of the voting-age population would drop by nearly half, from 8.5 percent to 4.7 percent. 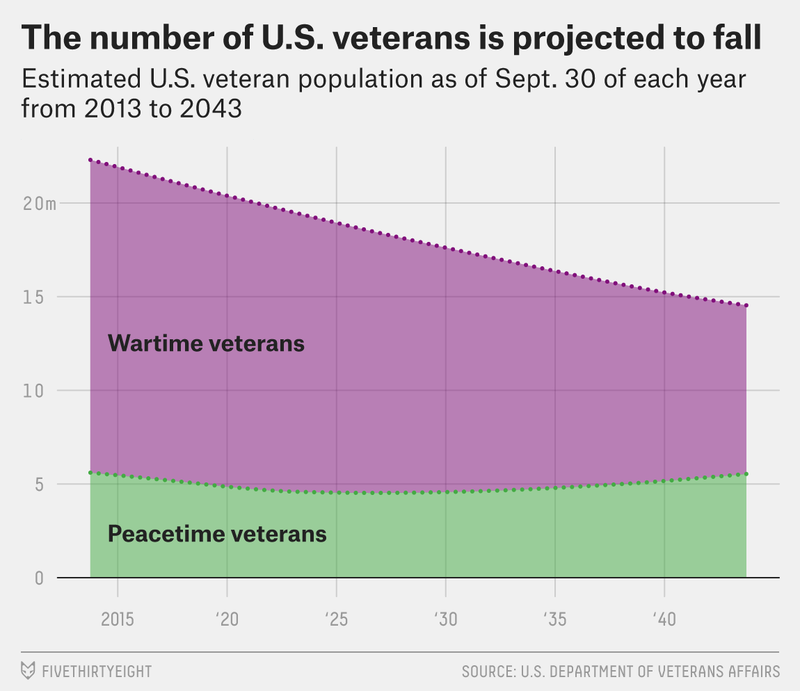 Current VA estimates go back only to 2013, and are based on a model called the Veteran Population Projection 2014. It’s the seventh version of a model first developed in the early 1990s. The previous model estimated that there were nearly 1.5 million veterans on Sept. 30, 2011 but fewer than 700,000 on Sept. 30, 2016. The numbers aren’t directly comparable because they come from different models, but the two models’ estimates are very similar for recent years. For instance, the previous model estimated that there would be 1.2 million living veterans of WWII in 2013; the current model estimates that number at around 1.1 million. Based on the numbers of living veterans projected in 2015 and 2017. The government considers people veterans if they served in the active-duty military and were discharged under conditions other than dishonorable. Veterans are counted as having served in a war if their period of service included at least part of that war.